Contact: Call 253-931-3950 for more information. 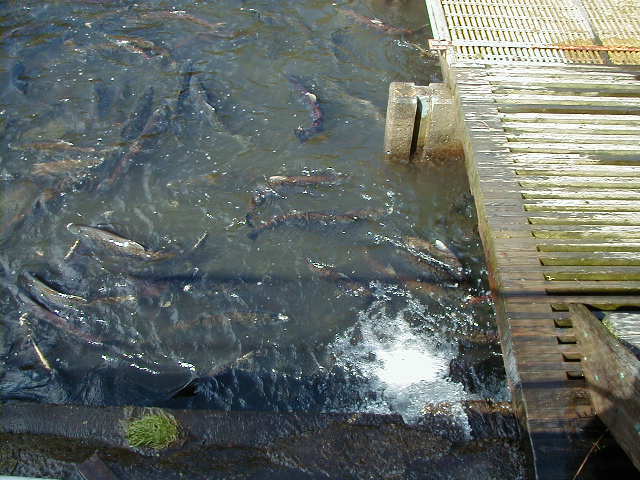 Chinook salmon usually begin to return to the 100-year old Soos Creek Salmon Hatchery in mid-September, with coho beginning to return around mid-October. The hatchery is open every day from 8:00am-4:00pm, though staff may not always be available to answer questions. Young fish are raised in tanks inside the building. Displays inside the door and at an outdoor kiosk explain hatchery operations and there is a viewing pond. People and pets should stay out of streams during spawning season and in the spring to avoid disturbing salmon nests (redds) in the gravel. 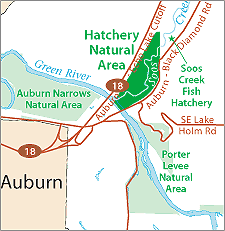 The hatchery, located on Soos Creek one river mile upstream of the Green River, is at 13030 Auburn-Black Diamond Road. Sponsored by: Soos Creek Salmon Hatchery. From Interstate 5, take Highway 18 east through Auburn. Take the exit for Auburn-Black Diamond Road and turn right at the bottom of the exit ramp. Stay on the Auburn-Black Diamond Road for about 1/2 mile (crossing the Green River), and turn left into the second hatchery entrance. Parking is free and rest rooms are available.